As a vegan, you might love cooking with egg replacer, but what's a vegan to do if you don't have any on hand? That's when recipes such as this no-egg and no-egg-replacer vegan white cake come in handy. In this simple vegan white cake recipe, the apple cider vinegar replaces the egg and will help make sure your white cake is light and fluffy. If you're looking for a simple white cake recipe perfect for a birthday, this is a good one to try. 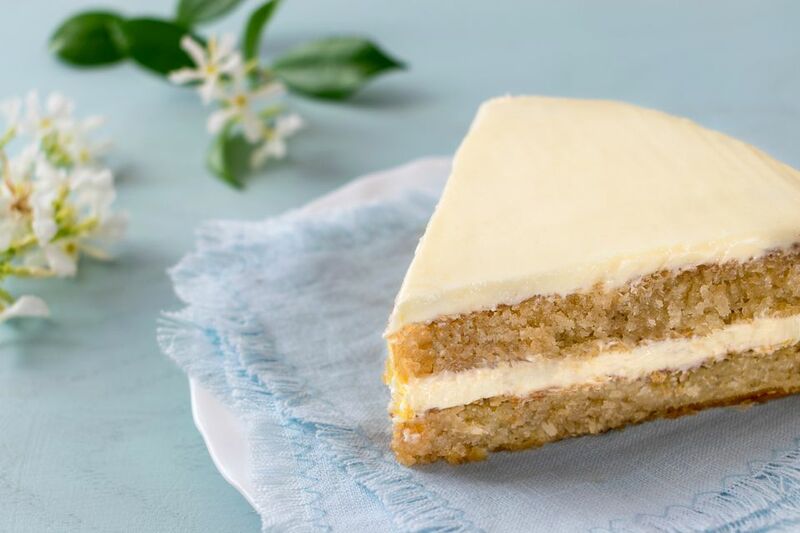 No matter the occasion, birthday or not, keep it simple by topping off your white cake with an easy vegan vanilla frosting, or get creative with an unusual frosting. This vegan almond flavored frosting might be nice or maybe even a vegan chocolate mint frosting. Don't forget the sprinkles! And yes, you can get some vegan sprinkles online. Grease and flour an 8-inch cake pan. Because this vegan white cake has very little fat, you might also want to line the pan with parchment paper to prevent it from sticking. In a medium bowl, sift together the flour, baking powder, and baking soda. Note: Even if you usually skip this step, you need it for this vegan white cake - so don't skip it! Sift sift sift! In a separate smaller bowl, whisk the salt, margarine, sugar, water, vanilla, and vinegar until blended. Bake your cake in the pre-heated for 30 to 40 minutes, or until a toothpick inserted into the center comes out clean. Cool the cake in the pan for 5 to 10 minutes, then carefully remove the cake from the pan to allow it to cool completely before frosting. Note that while regular white flour works just fine in most cake recipes and vegan cake recipes, when you're making a white cake, you may want to invest in pastry flour for the lightest and fluffiest cake possible. This white cake isn't quite as light and fluffy as, say, an angel food cake, but a few extra steps and tender loving care and patience can help you have the best possible finished product. This recipe makes just enough for a single layer 8-inch cake, so you may need to double the recipe if you need to make a larger sheet cake or a layer cake. Like making vegan cakes at home? Here's more easy vegan cake recipes to try. Enjoy!